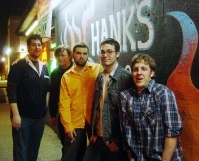 Band Bio: The Crevulators got together in late 2003 through mutual friends and newfangled technology. United by an interest in all-American music, 3-part harmony, energetic rhythm, and a show that's as much fun to watch as it is to listen to, The Crevulators are pioneers of a new genre they call "swingin' alt-countrybilly", because nobody else would call it that. They all live in New York City, where they swing through both the usual and unusual venues pretty regularly, with their new best pals and horniest horn section around, The Hornulators. Go check 'em out!